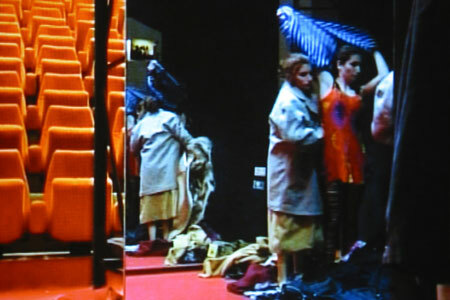 Inside a theatre, two twin sisters live in the space separating the stalls from the stage. In front of huge mirrors, they dress and undress as they try on all the costumes stored backstage. Meanwhile, the audience starts to enter the theatre and takes their seats, awaiting for the performance to begin. 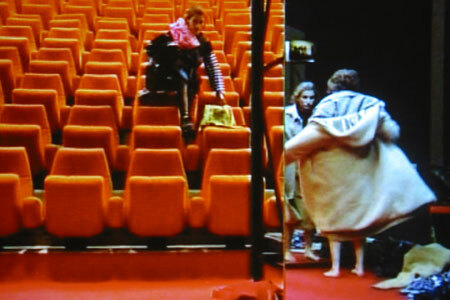 When the spectators suddenly disappear, one of the twins gathers the clothes they have left behind on the seats in the stalls. A lateral tracking shot, presented in a double projection with a sixsecond lapse between the two identical images, placed one in front of the other like two de-synchronised mirrors.